The use of natural makeup is something that is steadily becoming more and more popular, and with good reason. Research shows the chemicals in makeup are not only the cause of allergies and skin irritations but they can also aggravate asthma and have even been linked to some cancers. Over the long haul these chemicals will do nothing but damage and age our skin. Natural cosmetics have come a long way and there is a far greater selection of colors and products and they don't have to be any more expensive than regular cosmetics. Of course like anything else the more exotic the ingredients the more expensive they will be. My concern when I first thought of using natural makeup was if it would work as well as conventional cosmetics. The good news is that they work even better, especially for aging or acne prone skin. What ingredients are used in natural makeup? Natural cosmetics are made from minerals, mineral pigments, plant extracts and natural oils. Titanium Dioxide, Zinc Oxide, Mica and Magnesium are usually the main ingredients in mineral makeup. How are they better for your skin? The obvious is that natural cosmetics do not contain synthetic fragrances, harsh preservatives and dyes. These ingredients dry and irritate skin and over time and even if the rest of your skin care routine is natural you will undo any skin health benefits by putting regular makeup on your face. Dermatoligists have recognized that switching over to mineral makeup frequently prevents a lot of skin irritations caused by cosmetics. Mineral makeup is much lighter than regular makeup and will not clog up your pores. It absorbs extra oils on the skin and also will not support bacterial growth. Titanium Dioxide, Zinc Oxide, Mica and Magnesium have anti inflammatory properties so if you suffer from acne breakouts this makeup is ideal for you. 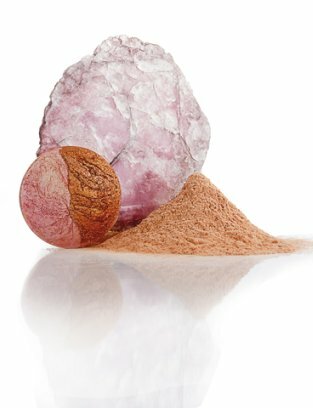 If you have aging skin you will love mineral makeup . Not only is it light so it doesn't settle in creases and wrinkles but it also reflects the light giving your skin a natural glow that you don't get with regular cosmetics. The minerals in these makeups also offer some protection from the sun and are ingredients used regularly in sunscreen products. This is excellent in preventing wrinkles or slowing down ones that have already started. The sun is the number one cause of wrinkles so all the help you can get the better! Do not rely on this alone for sunscreen. Always wear a natural sunscreen under your makeup. When purchasing natural makeup be sure to check for synthetic fragrances and dyes. Just because its called natural or mineral makeup does not mean that it is chemical free. Always read the list of ingredients before you buy it. This "natural" makeup may have only one natural ingredient in it and the rest is all synthetic chemicals. Some of these companies count on the consumer not taking a good look at the ingredients so you could be using a product that you think is natural but the truth is it is quite the opposite. There are several companies online that not only sell natural cosmetics but they use only organic ingredients. It is basically up to you to carefully read labels and read the small print but the switch over to natural makeup is definately worth it considering the difference it can make to your skin. Afterglow cosmetics is an excellent natural cosmetics company that is also woman owned and operated. Making my own makeup is not something I have tackled as of yet, but there are people that do make their own natural cosmetics. There are places online to buy these ingredients just like all the other skin care ingredients. I hope in the future to have a section dedicated to making your own natural makeup (once I've researched and tried several recipes), if that is something of interest to you. Any true natural product, homemade or not, will only benefit your skin and bring you one step closer to beautiful radiant skin!